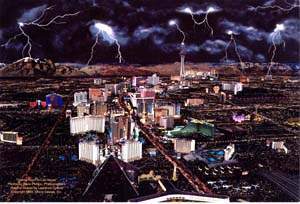 This postcard displays a nighttime stormy aerial view of fabulous Las Vegas, including many beautiful casinos plus the lovely mountains that surround Las Vegas are displayed with vivid color, and lightning. Postcard size is 6 inches by 9 inches. Minimum order is 10, Free USA shipping on all quantities of 10-10,000. Orders processed within 48-hours and shipped First Class mail. Retail price per postcard is $2.50.